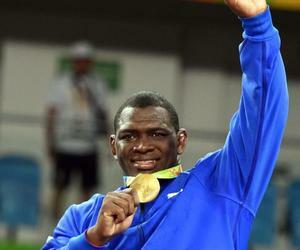 Cuban Mijain Lopez (130 kg) achieved the triple Olympic crown by beating 6-0 Turkish Riza Kayaalp in the final of the Greco-Roman wrestling tournament of Rio 2016 Olympic Games. Lopez defeated again his perennial rival in Olympics, as happened in London 2012, but in semifinals, after the European arrived preceded by having beaten him in the final of last year World Championship. With this victory, Mijain Lopez joined the elite made up by boxers Teofilo Stevenson and Felix Savon as only Cubans with three Olympic titles, added to those he conquered in Beijing 2008 (China) and the aforementioned in the British capital. He also joined Russian Alexander Karelin as the only three-time Olympic champions in this sport, although the mythical European competitor also holds in his curriculum a silver medal, to remain as the most awarded athlete of this sport.